Author(s): Wenying Yan, Guang Hu, Center for Systems Biology, Soochow University, Suzhou 215006, China. Bairong Shen. Topology plays a central role in the structure of a protein. Network theoretical methods are being increasingly applied to investigate protein topology. In this paper, amino acid contact energy networks (AACENs) are constructed for globular, transmembrane and toroidal proteins. The effects of topology on proteins are investigated by the differences of various network parameters among three kinds of protein topologies. Globular proteins are found to have the highest network density, average closeness and system vulnerability, while toroidal proteins have the lowest values of these parameters. Transmembrane proteins are found to have significantly higher assortativity values than globular and toroidal proteins. AACENs are constructed and compared for proteins with different secondary structure compositions, whose influences on biological functions are discussed in terms of topological descriptors. By extracting sub-networks only including interfacial residues between different chains, it may provide a simple but straightforward method to identify hot spots of toroidal proteins. This network study would offer new insight into overall topology and structural organization of different types of proteins. Keywords: Amino acid network, contact energy, protein topology, secondary structure, symmetry, toroidal proteins. Affiliation:Center for Systems Biology, Soochow University, Suzhou 215006, China. Keywords:Amino acid network, contact energy, protein topology, secondary structure, symmetry, toroidal proteins. 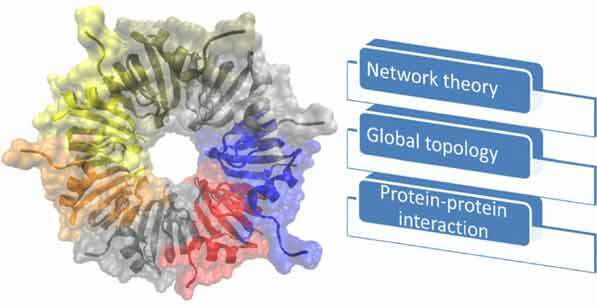 Abstract:Topology plays a central role in the structure of a protein. Network theoretical methods are being increasingly applied to investigate protein topology. In this paper, amino acid contact energy networks (AACENs) are constructed for globular, transmembrane and toroidal proteins. The effects of topology on proteins are investigated by the differences of various network parameters among three kinds of protein topologies. Globular proteins are found to have the highest network density, average closeness and system vulnerability, while toroidal proteins have the lowest values of these parameters. Transmembrane proteins are found to have significantly higher assortativity values than globular and toroidal proteins. AACENs are constructed and compared for proteins with different secondary structure compositions, whose influences on biological functions are discussed in terms of topological descriptors. By extracting sub-networks only including interfacial residues between different chains, it may provide a simple but straightforward method to identify hot spots of toroidal proteins. This network study would offer new insight into overall topology and structural organization of different types of proteins.